The gooey sticky rice wrapped in fragrant lotus leaf with delectable meat filling is one of my favorite dim sum items. Why make dim sum at home when you can go to a dim sum restaurant and be eating a wide array of steamed and fried dumplings, custard cups, bean curd rolls, puffs, and sesame balls off metal carts pushed by salty Asian ladies within 5 minutes of sitting down and pay approximately $10 per person? For one, I live in Davis and there are no dim sum restaurants in town. Also, Yuan was cooking for a dim sum dinner party (even though dim sum is technically breakfast/brunch food) and wanted to try out some menu items before his event. I did not object to being the guinea pig for his dim sum trials. Put rice in a large bowl, cover with cold water and soy sauce and soak overnight. Drain rice and steam so the rice is slightly underdone. Soak lotus leaves in boiling water for 1 hour. Soak mushrooms in warm water for 30 minutes, squeeze out excess water, then coarsely chop. Soak dried shrimps in warm water for 1 hour. Yes, it is a lot of soaking. For the filling, heat 1 tbsp of vegetable oil in a wok or large non-stick pan until hot. Stir fry meat cut into 1/2 inch cubes. Add shrimp, mushroom, garlic, sausage and scallions and stir fry for 1-2 minutes until aromatic. Add oyster sauce, soy sauce, sugar, and sesame oil and toss well. Combine corn starch with 3/4 cup water and add the slurry into the filling mixture. Simmer until sauce is thickened. Make rice into balls about the size of a golf ball and flatten slightly. Cut the lotus leaves in half. Place one rice ball on the leaf, put filling in middle, and cover with another rice ball. Wrap rice in the lotus leaf like a burrito and tie together. Steam for 30 minutes. These delectable packages can be frozen and steamed for 40 minutes. Hello there dear readers ( Hi Mrs.Chen! ), I’m back. We took a little summer vacation. Don’t judge, you took vacations too right? Anyway, I was packing, moving, traveling on the East Coast (to be another post) and some more moving. Don’t worry, I still managed to eat awfully well though. When I was on the East Coast, it was crazy hot. I loved that kind of weather but I wanted easy things to cook and eat that won’t heat up the kitchen. I stayed with my father for a week and he made some simple but tasty dishes with this chili oil he spooned on everything. Noodles, cucumber salad, celery salad… Perfect for a hot Virginia summer! I asked how he made it and made a batch as soon as I moved into my new place. It’s so simple and delicious, you can spoon it onto just about anything. I’ll always have a jar in the fridge now! 3) Carefully pour the oil into the jar a little bit at a time, it will bubble like crazy and then settle down. Pour more oil in after the bubbling dies down in batches until you use up all the oil. 4) After the oil is cool, you can put the lid on and keep it in the fridge or use it immediately. One of the things my dad made with the oil was a simple cucumber salad. I took the liberty of adding bacon to it cause what’s not better with bacon? 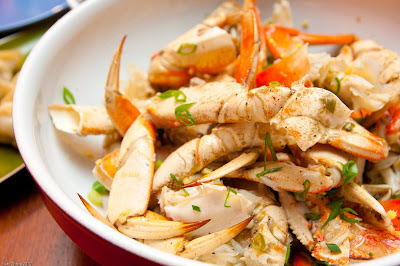 Steam the crabs over high heat for 14 minutes and cool immediately by rinsing crabs with cold water. Crack open the crabs and discard top, break the body and legs into sections. Use a heavy rolling pin to crack legs slightly. Combine corn starch and water mix into a slurry. Combine ingredients for sauce and have it ready. Heat a wok to medium high heat. Coat the wok with oil and stir fry scallion, ginger and garlic until lightly browned. Add the corn starch slurry and sauce and stir to combine. Let the mixture cook for about a minute to thicken, taste at this point and add salt and pepper if needed. Add the crab sections back in and stir to coat well. Cook for about a minute. Add the reserved green scallions and toss.